Shards of light squeezed through the trees on to a cold, dry Mugdock course. Sorry, I’ll say that again. A DRY Mugdock course. Even the event organisers looked slightly concerned that the words “dry” and “Mugdock” in the same sentence could signal the end of the world as we know it. But even given the fear of apocalyptic signals, dawn did indeed break over the Glasgow Mountain Bike marshals who got up early to beaver away setting up the course. They set up a superb course, twisting through the trees, across the open fields and around the fast forestry track. They also sneaked in a few tricky descents, an energy-sapping running climb and the infamous log cross. Mugdock has a reputation for some classic single track and this 2010 course delivered again. And along with the classic single track comes classic racing. 48 riders took off from the gun, raced round the arena and took off down the hill into the trees. Unfortunately the really short lap meant that they all reappeared again very quickly and within two minutes there was a constant stream of competitors, all mixed up, making it pretty challenging for commentators/reporters to keep up with what was happening. We really weren’t envying the lap counters and can only apologise for the brevity of this week’s report! Jamie Willoughby appeared back into the arena first, closely followed by Danny Mulholland and Cameron Mason. Unfortunately a problem with his chain half way through the race put paid to his hopes and allowed Cameron to take the lead. Andrew Merry was on a mission though and he powered through to take the win, with Cameron holding off Jamie to take second. Katie Allen brought it home first for the girls, followed by Rhona Cameron. The course was already really slippy with several riders coming a cropper on the grass. Special mention goes to Keir Robb who crashed on the last corner and still picked himself up and legged it across the line. Hey - I did warn you it would be short! Fortunately the youths rode the full lap distance making it alot easier for reporters to drink coffee - sorry - keep up with what was happening. We had 32 fighting it out but one racer led from the start and didn’t give up that lead throughout the whole race. Thomas Van Holen (Black Isle MTB) - he came from the north and took charge. It was a close run thing at times though - Calum Magowen was snapping at his heels for most of the race and only lost ground on the second to last lap. Sean Noon and Stuart Balfour had a good old battle behind them but Sean took a tumble at the hurdles on lap 4 which allowed Hamish Carrick to come though and take his place. By the end Thomas had a commanding lead and came across the line with his front wheel high in the air. And continued in that style all the way to the trees. Well I suppose someone has to make up for Craig Hardie’s absence. Calum came in second (but first U14) and Stuart was third. The girl’s race was another close fought battle between Lucy Grant and Louise Borthwick. There was little to separate them for the first four laps but then Lucy pulled out a small gap and next time round she was home and dry with a good 30 seconds on Louise. Megan Riach came in third. A massive field of 100+ riders lined up on the long grassy climb for the start. In old classic cyclocross style some riders opted for a running start up the rise. The rest of the field fought for space on the narrow path up one side of the hill. As the field filtered together inevitably some riders touched and came down, this held the chasing field up for a short period but soon everyone was back on the bike and attacking the course. The first lap saw Mick Nally, Franco Porco, Ian Nimmo, James Melville and Brendan Roe lead the vets over the line. With Alexis Barnes, Maddy Robinson, Lyndsey Carson, Anna Walker, Elke Schmidt and Kim Craigie leading the women’s race. Graham Gould completed the full field over the line for the first time. In the second lap Ian started to pull out a gap on the talented field. His twenty second lead was comfortable but he continued to push out the gap. Impressively, Gary McRae had moved through the field into second place but the chasing riders all stayed close to one another. The women’s race started to gap with Alexis leading with a 30 second lead on Maddy despite a slide in the main arena. Eileen Row had stormed up through the field to battle with Lyndsay and Elke for third. Unfortunately, a nasty crash down at the bridge saw Eileen come away with an injury. She made it back to the start line but she knew something was not right and retired. The riders soon settled down into the rhythm of the course until the last few laps. With 15 minutes to go Ian had extended his lead to 50 seconds over Gary and he had in turn created a comfortable one and a half minute gap over the next place rider - Mick. Mick was chased by James who had defended his position from Franco and a very fast chasing John McAfferty, but still only 30 seconds separated all three riders. Then as fast as he had pulled away disaster struck Ian. A rear mech mechanical (read catastrophic mechanical failure) left Ian pushing his bike back to the car park. Within a blink of an eye all the riders moved up a placing; Gary to first, Mick to second and the riders separated by the 30 seconds now had a podium placing in their sights. Alexis continued to extend her lead over the now second placed rider Elke. With Maddy only down 30 second on Elke and Lyndsay chasing close behind the women’s placing were still up for grabs. The Vets race was a battle to the end with the last lap seeing frantic efforts pulled from the depths of any muscle which was not screaming. Slightly overzealous enthusiasm from James at the thought of his first podium place of the season ended with a tangle with a back marker as he headed in to the last lap. He kept his cool though as was soon back fully focused on finding that last effort to hold off Franco. With no more drama Gary took a deserved win, Mick second and James crossed the line in third. Alexis continued her dominance over the SCX women’s race, with Elke an impressive second and Maddy a well-deserved third. Most stylish rider over the hurdles this week goes to James McLaren (Johnston Wheelers) who seemed to clear these with ease. Unlike Luke Devereux (GMBC) who rather skilfully, but not gracefully rode the huddles to the screams of “You break them, you pay for them” from the organisers. Anyway, 53 did turn up and a cracking race it turned out to be. As the start was quite some distance from the arena everyone was waiting expectantly to see who would emerge from the trees first. Who would it be.....? Neil Walker! Closely followed by Sean Clark, Andrew Cox, Davie Lines and Dan Whitehead - Dan making his first appearance of the season and having a wee crash at the hurdles to celebrate. Through they all came and off into the trees they went. There was quite a gap before we saw then again which did give Jammy ample opportunity to commentate on Mike Dickinson and his mechanical woes in the pits. I’m sure Mike welcomed the attention as he wrestled with his wheel. Neil, Dan and Davie were neck and neck on the second lap but James Fraser-Moodie had taken over by the next lap. Well that’s that then we all thought as he proceeded to take a 30 second lead out of Davie and Dan. Sadly his wheels had other ideas and on lap 9 a broken spoke incurred an unwelcome run to the pits to swap bikes. The race was on to catch the others and try to make some places but time was running out. At this point Dan was in the lead and - happily for the resident Moulin cheerleading squad - Andy Wardman had overtaken Davie Lines to move up to second. Behind them was Colin May (impressive on his single speed mountain bike) and Greig Walker. Just behind them James was on the charge. Due to the cancellation of Knockburn Loch this weekend we have a couple of weekends off before the SCX caravan trundles off to the Kingdom of Fife for the Steven Lyle Memorial at Lochore Meadows. Surely the weather can’t hold for another race....? Lovely day out at Mugdock - Just a pity the kids results causing difficulty again! It is a race after all! This was an issue last year (in the rain) so should have been expected this year! I'm not sure why the timing chips weren't used - this should remove any headaches! If this isn't possible for some reason then I suggest the different age categories have different coloured numbers. If this isn't possible the only other option would seem to be to run 3 different races! The gifts for all the riders were great but I think to retain the kids interest the results for all age groups need to be available immediately after the race. My child did not win but will always ask and be interested in how far down the fied they finished! The announcer also criticised the participants /parents for turning up late for registration! We arrived at 9:10. The queue was out the door and we did not get out the queue till 9:40 so I don't think it is late arrivals that are causing the problem. The registration process needs to be reviewed or started earlier! I believe the SCX could learn a thing or two from the SXC organisers where results are available immediately due to the use of timing chips attached to the bikes. Waiting until Wednesday to find out your place seems a bit long when technology is tried and proven. It would also be useful to take advantage of Entrycentral to cut down on queues on the day; again, tried and proven. It would most definitely be better to split the age groups especially for Youth A and B and lower down C, D and E. SXC use a staggered start but then this works because of the use of the timing system. Anonymous1 - have been passed U12 results now, will post tomorrow. Timing system not used for U12s, but we may look to do this next year. Would likely result in having to charge for entry. SC rules allow organisers to charge £1 per rider. 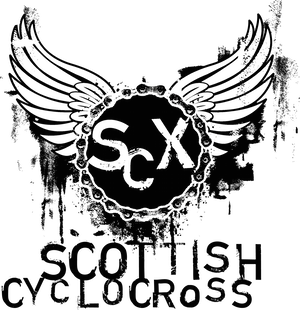 Anonymous2 - we do keep an eye on what's going on with SXC and at other CX events nationally (and internationally too). Timing system - this is being developed for SCX and is only four races old, so electronic results are being checked in detail against manual records for accuracy. I'd hope we can move to publish results more quickly in the 2nd half of the season. Although the timing team are being funded by organisers and SCX, they still have to fit things around work. SXC employ a commercial team who charge substantially more than this system is costing organisers and SCX. Incidentally, we also looked to hire systems from clubs who have received funding for timing systems, but costs were prohibitive. Entry Central - maybe something we can look at for next season, but there is a £1 per rider charge (as I understand it), so this would have to be passed on to riders. At the Scottish Cycling AGM last year, there was talk of a new British / Scottish Cycling website which would allow online entry, but this has not materialised. Youth & U12 - we're now at the point where each of these categories are attracting more riders than used to enter an entire day of CX racing a few years back. We need to have a close look, with Scottish Cycling, at where we go with these categories next season. On the SCX - vs - SXC issue, it is worth reading my post on the SXC forum last year regarding the costs of each series. I think that SCX has to evolve its own course over the next few years, rather than try to mirror SXC - keep the costs to riders and organisers down as much as possible to keep the grass roots element strong! SXC costs a senior £25 to ride. SCX is a tenner - do people want to pay so much more for results to be available a day or two sooner? Chris and Dan had results from Plean posted up on Monday night and Strathclyde on the Sunday night. Mugdock was available on the Tuesday night - how much sooner do you need them if you finish 27th in a race??? Entry central costs were absorbed in the £10 entry fee by Stirling Bike Club at Plean, as was the cost of using timing chips for the U12s. As a result, prize fund was a bit less. This came out of £10 per rider and £5 for youths - all under 12s ride free. The club were left with around £80-90 which I would have preferred to go in prizes/spot prizes but the trouble with entry on the line is it is hard to work out exactly how much you have to play with to hand out in prizes - I was worried I wouldn't have enough but it turns out I could have given a bit more. In regards to Entrycentral. £1 extra on the cost to enter doesn't seem exhorbitant and would result in £215, going by 215 entries as stated above and makes life much easier for the organisers and participants on race day. An extra pound even in these hard times doesn't seem a lot. Anyway, if people would rather wait a half hour to sign on and organisers have to deal with so many entries on the day fair enough. Looking forward to the next race as they have all been great. So please don't take this as a criticism just trying to be constructive. Many thanks to all the organisers for their time and considerable effort. All contructive criticism gratefully received. Entry Central - we've tried to hold down prices as much as possible, but as we'd already increased prices by £2 this year, an extra £1 might have been too much in one go. We've now had a number of the races with traditionally big turnouts (Plean & Mugdock), so hopefully queues will be smaller from here on in. SC will always require a rider to sign-on on the day, so there's always going to be a bit of form filling / scrawling required. Timing systems - IIRC main problem was that the timing systems had to come with people from the owning clubs to operate them (an insurance thing? ), so costs included their expenses. Having our own timing system has been a long term aim for SCX, but only with the RFID based system has it become affordable. Grant - thanks for sharing figures from Plean CX. As I understand it, a proportion of the SC levy comes back to SCX, which we then reinvest back into CX. Hey, no offence taken (or intended with my post either). Marty, I understand SCX are paying 50% of the timing costs so I know no-one is making money out of the events and I wasn't meaning that I wanted the extra surcharge money to be kept by the club either in terms of just getting stuck away in a bank account - rather it would be good if it could go to the prize fund. Anyway, I think this is an SCU rule as opposed to SCX? Ultimately if the extra £1 in surcharge money is going back into the sport via SCX then I don't have an issue with it but if it is going to SCU coffers then that I do have a slight problem with as they already get a fair slice of the pie. P.S. how come there isn't cross action north of the border in January/Feb? Is it just a tradition up here that the events are over by Christmas?? Just curious as January is a completely free month - even the road reliability runs don't start until Feb/March.